Not everyone can see this right now (we were unable to verify it), but it seems like Apple is testing related search suggestions on its App Store, as Macstories reports. First spotted by Time Planner co-founder Olga Osadcha on Twitter, who tweeted screenshots from her iPhone, the feature throws up related terms at the top of the App Store’s search results page. Update: An Apple spokesperson tells us that the feature will roll out to all users over in “the coming weeks”. According to Osadcha, clicking on any of the suggestions leads to even more related search terms. It isn’t certain yet whether Apple will roll out this feature to everyone on iOS 7, or if it’s just a mere experiment that won’t make the cut eventually. 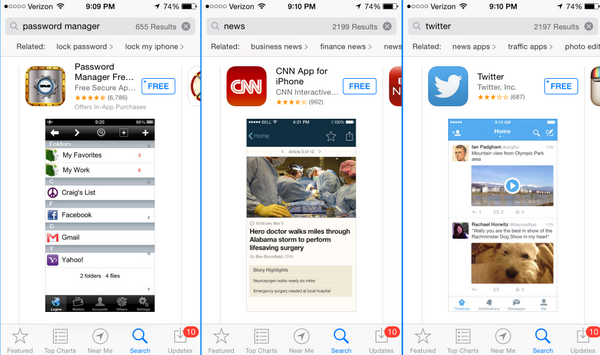 Given that Apple is often criticized for not improving App Store search, this addition could be a very welcome one.